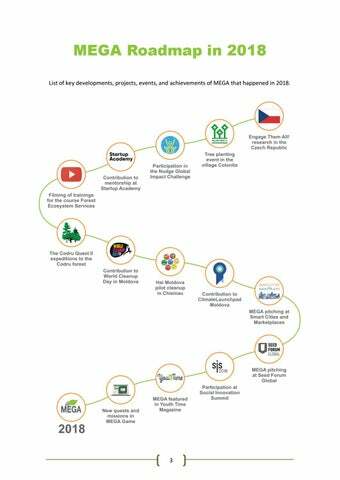 MEGA Annual Report 2018 represents the summary of the environmental and social projects realized, services delivered, events organised, results achieved, and positive environmental and social impact created by the Moldovan Environmental Governance Academy (MEGA) during the year 2018. The Report also describes and acknowledges the support, both financial and in-kind, offered to the organisation by its partners and sponsors, as well as mentions how this support was channelled into creation of positive change for society and the natural environment. In the end of the Report, the main achievements and impact of MEGA in 2018 are presented. For additional information and inquiries, please contact the MEGA Team by e-mail: hello@megageneration.com. Prepared by: Alexandr Iscenco. Design: Alexandr Iscenco. Original design: Ruxanda VĂŽhrest. Photos: Alexandr Iscenco, Gabriela Isac, Mihail Cebanu, Sharifi Kardo, ClimateLaunchpad Moldova, Dreamups Innovation Campus, EcoVisio, GIZ, GoSocial, Hai Moldova, Nudge, and Tekwill. MEGA Roadmap in 2018 List of key developments, projects, events, and achievements of MEGA that happened in 2018. 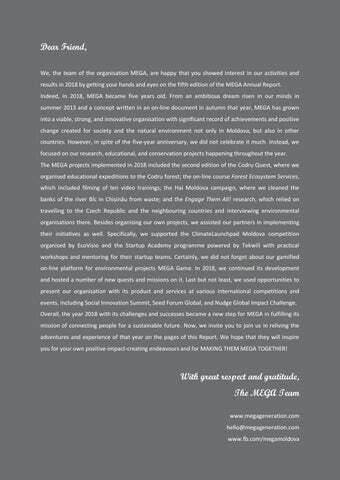 Dear Friend, We, the team of the organisation MEGA, are happy that you showed interest in our activities and results in 2018 by getting your hands and eyes on the fifth edition of the MEGA Annual Report. Indeed, in 2018, MEGA became five years old. From an ambitious dream risen in our minds in summer 2013 and a concept written in an on-line document in autumn that year, MEGA has grown into a viable, strong, and innovative organisation with significant record of achievements and positive change created for society and the natural environment not only in Moldova, but also in other countries. However, in spite of the five-year anniversary, we did not celebrate it much. Instead, we focused on our research, educational, and conservation projects happening throughout the year. The MEGA projects implemented in 2018 included the second edition of the Codru Quest, where we organised educational expeditions to the Codru forest; the on-line course Forest Ecosystem Services, which included filming of ten video trainings; the Hai Moldova campaign, where we cleaned the banks of the river Bîc in Chișinău from waste; and the Engage Them All! research, which relied on travelling to the Czech Republic and the neighbouring countries and interviewing environmental organisations there. Besides organising our own projects, we assisted our partners in implementing their initiatives as well. Specifically, we supported the ClimateLaunchpad Moldova competition organised by EcoVisio and the Startup Academy programme powered by Tekwill with practical workshops and mentoring for their startup teams. Certainly, we did not forget about our gamified on-line platform for environmental projects MEGA Game. In 2018, we continued its development and hosted a number of new quests and missions on it. Last but not least, we used opportunities to present our organisation with its product and services at various international competitions and events, including Social Innovation Summit, Seed Forum Global, and Nudge Global Impact Challenge. Overall, the year 2018 with its challenges and successes became a new step for MEGA in fulfilling its mission of connecting people for a sustainable future. Now, we invite you to join us in reliving the adventures and experience of that year on the pages of this Report. We hope that they will inspire you for your own positive-impact-creating endeavours and for MAKING THEM MEGA TOGETHER! and social value. Founded in November 2013, MEGA has now evolved into an experienced, collaborative, and innovative player within the community of environment-and-sustainability-oriented entities in Moldova and beyond. MEGA Vision A sustainable future, where every person and organisation contributes to nature conservation and sustainable development through creation of positive environmental and social impact in a collaborative, innovative, enjoyable, and fun way anywhere in the world. MEGA Mission Connecting people for a sustainable future. * *Developed and accepted in 2017, this mission of MEGA means that we create a sustainable future not just through our own efforts. Mainly, we connect other people and organisations together and empower them with resources and tools to create the sustainable future all of us want. MEGA Values PASSION: We exist to serve the Nature and people COOPERATION: We believe in the power of communities SUSTAINABILITY: We act sustainably in everything we do EXCELLENCE: We strive for excellence in all our endeavours FUN: We do serious work in a fun way LEADERSHIP: We lead by example TEAMWORK: We make it MEGA TOGETHER! management and collaboration between organisations and individuals, while also addressing the issue of information asymmetries in the environmental and sustainability sector. The platform allows environmental organisations (called Mission Providers) to connect with young volunteers (called Green Agents), educate them on various environmental topics and Sustainable Development Goals, research existing environmental issues, manage their projects, monitor progress, display positive impact achieved, and report to stakeholders. In 2018, we continued enhancing the features and overall performance of MEGA Game. Specifically, we improved the synchronization of the platform with its databases and removed many bugs and errors, so that MEGA Game works smoothly and in a stable manner. In addition, we proceeded with development and testing of the smartphone application connected to MEGA Game. The latest version of the MEGA Game platform with all the updates can be accessed and used at www.megageneration.com. Management” created as part of the Codru Quest II project. Within this course, the platform hosted its video trainings and the Forest Ecosystem Services quest. In terms of traction, in 2018, MEGA Game was used by 22 environmental and social organisations and 134 individual environmentalists and volunteers. another initiative of our organisation, MEGA Impact Championship. II: A New Hope. Conservation of Ecosystems and Biodiversity in the Codru Forest through Education, Gamified Research, and Stakeholder Engagementâ&#x20AC;?. Its aim was to raise awareness about threats to the Codru forest in Moldova among relevant stakeholders, to educate them on the value of forest ecosystem services, and to engage these stakeholders into conservation and sustainable management of the Codru forest and other forest ecosystems. To achieve this aim, we organised guided expeditions into forests, delivered a series of trainings on the topic of integrating ecosystem services into development planning, joined a tree planting event, and then stimulated further discussions through meetups. Overall, through the expeditions, trainings, and events of the Codru Quest II, we succeeded in educating and engaging more than 30 individuals and organisations. Management” is a practical e-learning course on the topic of forests, economic valuation of their ecosystem services, and approaches to conservation and sustainable management of forest ecosystems. The course was developed by our organisation as one of the key outcomes of the Codru Quest II project. In 2018, we began gathering information for the course content from literature sources, our previous research conducted as part of the first edition of the Codru Quest project, and our expeditions to forests organised within its second edition. That information then went into writing of the course manual “Forest Ecosystem Services”. In addition, while exploring the forests, we started filming video trainings for the course. Afterwards, we uploaded these trainings to the MEGA channel on YouTube and connected them to the e-learning website created for the course. Eventually, over 100 visitors of the channel and the website watched our trainings and learnt about the value of forest ecosystem services from them. In 2018, MEGA supported the Hai Moldova campaign in managing a spring cleanup activity in parks of the capital city Chișinău, in organising a pilot cleanup event along the river Bîc flowing through Chișinău, and in stimulating strategic discussions with key stakeholders of the campaign. Furthermore, together with approximately 50 volunteers involved into these events, members of the MEGA Team gathered roughly 77 bags of waste from the city parks and the banks of the river Bic. About 42 of these bags were then transported to municipal waste management facilities for proper recycling. Finally yet importantly, we assisted Hai Moldova in engaging 10 important strategic partners and sponsors into the campaign, thus ensuring the necessary financial and logistic support for realizing the World Cleanup Day 2018 event in the Republic of Moldova. of these countries. In Moldova, the National Final is organised by EcoVisio. happy to support this initiative. Therefore, in 2018, we were glad to join its training sessions and contribute to education and preparation of prospective CleanTech entrepreneurs with a workshop on Climate Impact and CleanTech Entrepreneurship. After the workshop, we also provided coaching support to participating teams regarding preparation of their pitch decks. Ultimately, we also joined the National Final as jury members and helped to assess the performance of seven pitching startups and then to decide upon the three National Finalists. Startup Academy is an educational programme on entrepreneurship and business development for young people in Moldova. It includes a three-month course combined with practical startup-development exercises and continuous mentoring support. The learning, practicing, and mentoring process concludes with a Demo Day, when participants present their startups together with products or services developed during the programme. Startup Academy is organised by the Moldovan Association of ICT Companies (ATIC) and Tekwill. We were invited into Startup Academy as mentors to assist its participants with startup development, market validation, and pitch deck preparation. Certainly, we were happy and honoured to accept the invite and to join the group of diverse mentors of the programme. We then took responsibility for supporting two participating startup teams and did so through on-line and off-line communication. Of course, during common mentoring meetings we also shared our knowledge and gave advice to any other participants, who sought them. development. It focuses specifically on studying methods and best practices of applying modern information technology and on-line tools in these areas. In 2018, we saw the need of many environmental organisations from our network to improve their knowledge and skills in working with on-line instruments. To respond to this need, we proposed to interview innovative and successful organisations and startups on this topic and then share their experience and best practices with others. This proposal resulted in our threemonth research stay in the Czech Republic, supported by the Prague Civil Society Centre. As a result of this research stay, we succeeded in gathering experiences and best practices of 30 organisations and startups from 15 countries. All this information will go into the book “Engage Them All!” to be published in 2019. In addition to developing MEGA Game further, providing it to our partners for their environmental projects, organizing our own nature conservation initiatives, and delivering research and educational services, we continued attending various events and contributing to their success. In 2018, we participated in 20 international conferences, training programmes, startup competitions, and environmental campaigns in eight countries. Most of them were connected to capacity building on the topic of sustainable development and to pitching entrepreneurial ideas before investors. Presented below are the most important events for MEGA in 2018. Training of Trainers on Economic Valuation of Ecosystem Services, a training programme organised by GIZ within its project ValuES in Eschborn, Germany, in February 2018. By participating there, we developed our training skills to educate environmental organisations and policy-makers on the topic of economic valuation of ecosystem services. The knowledge from the programme we then invested into the Codru Quest II project and the Forest Ecosystem Services course. EdTech Hackathon, a weekend-long hackathon organised by Garage48 at iHub in Chișinău, Moldova, in February 2018. At this event, we learnt how to build a hardware product in the domain of education and learning. We immediately put this knowledge into practice by creating Kits4Kids, an electronic “constructor” of ecosystems with insect models for teaching children the basics of biodiversity and its conservation. In the end, Kits4Kids was awarded as a promising project. Social Innovation Summit, an international conference organised by Social Entrepreneurship BW (SocEntBW) in Stuttgart, Germany, in March 2018. At the summit, we met with many inspiring social entrepreneurs and gained insights on how social entrepreneurship is developing in Western Europe. In addition, we reconnected with several members and alumni of Ashoka ChangemakerXchange, an international community of social leaders that we are part of. Forum of Environmental Organisations, a national conference organised by Eco Contact in Chișinău, Moldova, in April 2018. At the forum, we refreshed our knowledge on the current state of environmental legislation and related policies in Moldova. We also contributed to the workshop on communicating environment-related information to the public by sharing our own experience in working with communication tools and channels within our projects. Keep Cool for Multipliers, a workshop organised by EcoVisio in Chișinău, Moldova, in May 2018. At the workshop, we developed our skills in organising and facilitating a gameplay event using the Keep Cool board game about climate change negotiations. Then, we applied our skills into facilitating a round of Keep Cool gameplay with other participants. Finally, we tested the on-line version of the game and provided feedback and suggestions on how to improve it. YES-Europe Conference, a local conference organised by YES-Europe Moldova in Chișinău, Moldova, in May 2018. At the conference, we contributed to a workshop and a discussion about entrepreneurship in the domain of renewable energy and energy efficiency. After sharing examples of energy-focused startups observed in Denmark, Norway, the US, and other countries that we visited, we then promoted the ClimateLaunchpad Moldova competition, which we support. Seed Forum Global, a startup-pitching event organised by Seed Forum in Oslo, Norway, in June 2018. Our participation in this event was possible due to the support of Tekwill, USAID, the Government of Sweden, and MIEPO. After pitching MEGA at Seed Forum Global in Oslo, we travelled to Stockholm, Sweden, for a study visit to local startup accelerators and co-working spaces. There, we also explored how Stockholm develops in terms of green spaces and sustainability. Smart Cities and Marketplaces, a local conference organised by IDIS Viitorul and MAIB in Chișinău, Moldova, in June 2018. Besides taking part in the discussions of the conference about the development of smart cities and learning about several examples of such development in Romania, we also presented MEGA before Romanian investors within the startup-pitching part of the agenda. Ultimately, we gained a number of new contacts of potential customers for our MEGA Game. “The Precautionary Principle in Sustainability Transitions: Thinking forwards, Looking backwards, Acting”, a summer school organised by Central European University, European Environment Agency (EEA), Erda RTE, and Bridging for Sustainability in Budapest, Hungary, in June–July 2018. From this school, we learnt what the precautionary principle is and how to apply it in nature conservation and sustainable development. We also became alumni of the EEAcademy of EEA. Hai Moldova Stakeholders Meeting, a networking and discussion event organised by Hai Moldova in Chișinău, Moldova, in August 2018. At the event, we joined the discussions about the realization of the World Cleanup Day in the country, as well as about possible solutions for maintaining Moldova clean from waste after that day. Additionally, we assisted the organisers of this national campaign to set up strategic partnerships with the most important and resourceful stakeholders. “NEXT – Nature-based Solutions for Smart Cities”, a summer school organised by the Belarusian-Russian University and its partners in Mahilioŭ, Belarus, in August 2018. There, we learnt about various approaches and solutions to urban development, which considers protection of the natural environment in cities. In terms of practicing that knowledge, we researched the state of the Piačersk Forest and Park in Mahilioŭ and developed a proposal for its sustainable management. Hai Moldova Pilot Cleanup, a waste cleanup event organised by Hai Moldova in Chișinău, Moldova, in September 2018. At this event, we supported the national campaign for a clean Moldova with managing a pilot cleanup activity with around 50 volunteers before the grand World Cleanup Day 2018. As a result, we removed over 77 bags of waste from the banks of the river Bîc flowing through the city. In such way, we helped Hai Moldova prepare for their main event of the year. Keep Cool Gameplay, a networking, gameplay, and discussion event organised by EcoVisio in Chișinău, Moldova, in September 2018. There, we applied our knowledge and skills in working with the Keep Cool board game to facilitate a round of gameplay together with the organisers. After that, we contributed to the discussion about climate change, current state of global climate negotiations, personal climate footprint, and practical ways of reducing it in everyday life. ClimateLaunchpad Moldova National Final, a startup competition organised by EIT Climate-KIC and EcoVisio in Chișinău, Moldova, in September 2018. We contributed to the National Final as members of the jury helping to evaluate the quality of startup pitches and to determine the three National Finalists. After that, we joined the World Cleanup Day, organised by Hai Moldova in the entire country, and together with other volunteers cleaned Chișinău parks from waste. Hai Moldova Partners Meeting, a discussion event organised by Hai Moldova in Chișinău, Moldova, in October 2018. There, we joined the community of partners of the national cleanup campaign to discuss and decide upon practical solutions for reducing and recycling waste in Moldova that should be implemented as a follow-up of the World Cleanup Day. Together with other participants, we elaborated a number of projects and next steps for Hai Moldova for 2019. Forum 2000, an international conference organised by the Forum 2000 Foundation in Prague, the Czech Republic, in October 2018. This conference became our “welcoming event” to the research stay in the Czech Republic within our project Engage Them All! There, we documented a number of innovative approaches and tools for civic engagement into various social initiatives used by organisations that attended Forum 2000. Nudge Global Impact Challenge, a sustainability-oriented training programme and competition organised by Nudge in Zeist, the Netherlands, in October 2018. We were selected for the Challenge as Wild Card participants. There, we benefitted from training and mentoring support in terms of leadership for sustainable development. However, the most important value of the Challenge for us was that it inspired us for the idea of the GreenTech Rangers acceleration programme. Planting Good Deeds in Colonița, a tree-planting event organised by Plantăm fapte bune în Moldova as part of their national campaign Million Trees Moldova in the village Colonița, Moldova, in November 2018. During the event, we supported its organisers with filming the tree planting process and documenting the experience of participating volunteers. Certainly, we also joined the volunteers there and planted a number of trees near the village as well. All the developments of MEGA Game, organisation of our environmental projects, delivery of our services, and our participation at various events were possible due to an international community of supportive MEGA Partners and Friends. Many of them remained close to us in 2018 and offered valuable financial and in-kind contribution to MEGAâ&#x20AC;&#x2122;s projects and initiatives, as well as mentoring and advisory support in terms of social entrepreneurial development of our organisation. There were also new supporters, who joined us during the year and lent a helpful hand to our team. Altogether, these Partners and Friends, both existing and new ones, assisted MEGA in creating even greater value for civil society, social entrepreneurship, and the natural environment in Moldova and beyond, at the same time supporting our mission of connecting people for a sustainable future. Presented below are the organisations, companies, institutions, and foundations, to whom we express our gratitude and appreciation for the support provided to us, as well as the work done together with us, in 2018. We are also grateful to many incredible people, who contributed to the organisation and its initiatives in 2018 as team members, volunteers, participants, respondents, supporters, and simply great and trustworthy friends! The year 2018 was a financially challenging one for MEGA. Both our operating budget and the amount of revenue generated were rather low, as it can be observed below. 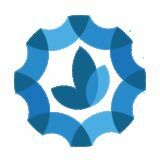 The main reason for this financial situation was that we focused most of our fundraising efforts on setting up MEGAâ&#x20AC;&#x2122;s spin-off enterprise ENVERACE. Besides that, most of the support from our Partners was either in an in-kind form or in a financial form that came to us indirectly. The majority of the financial resources were raised as grants and sponsorships. Among them, the largest share came from the Rufford Foundation for the Codru Quest II project and the Forest Ecosystem Services e-learning course. Besides this grant and other sponsorship contributions, we also attracted a certain sum of donations. Practically all the available financial resources went into further development of MEGA Game, organisation of our projects, filming of the video trainings for the on-line course, and coverage of ongoing administrative expenses. In 2018, MEGA together with its MEGA Game platform, environmental projects, and research and educational initiatives was mentioned by seven local mass-media agencies and international organisations. The information about our organisation was posted on two on-line news portals, three websites of different organisations and a foundation, one university blog, and one private blog. Geographical origin and primary audience of these on-line mass media included such countries as Moldova, the Czech Republic, Germany, the UK, and the US. Conservation Journey What's the Future of Moldova's Biodiversity? Talking to an Env. Economist and Scifi Writer. December 2018. Prague Civil Society Centre Our Former Fellows. December 2018. Reportaje Moldova.org Trei tineri au o afacere de dragul naturii. February 2018. Tekwill Moldova Goes to Seed Forum. June 2018. The Rufford Foundation The Codru Quest II: A New Hope. Conservation of Ecosystems and Biodiversity in the Codru Forest through Education, Gamified Research, and Stakeholder Engagement. February 2018. University of California, Berkeley Eco-hackathon for a Sustainable Future. March 2018. Youth Time Magazine Play for Impact: Gamification in the Service of Social and Environmental Issues. January 2018. Do you believe in our vision and mission? Do you share our values? Would you like to assist our organisation in further development and creation of even greater positive change in society and the natural environment? If your answer to at least one of these questions is “Yes”, then we invite you to support MEGA with your contribution. This contribution can be in the form of financial sponsorship sent by bank transfer or as an allocation of 2% of your annual income tax. We will be most grateful to you for any form of support you choose. Before April 30, 2019, download and fill in the two Income Tax Declaration forms: CET15 and CET18. In sections 6 (M2) of CET15 and 5 (M1) of CET18, enter the registration / ID number of MEGA: 1013620010125. Submit the Declaration to your tax office in person, by post, or by using the on-line tax services. Key developments, projects, events, and achievements of the social entrepreneurial organisation MEGA that happened in 2018.